The report is mainly structured around the six thematic areas of cooperation identified in the OIC Strategic Health Programme of Action (OIC-SHPA) 2014-2023, namely Health System Strengthening; Disease Prevention and Control; Maternal, New-born and Child Health and Nutrition; Medicines, Vaccines and Medical Technologies; Emergency Health Response and Interventions; and Information, Research, Education and Advocacy. 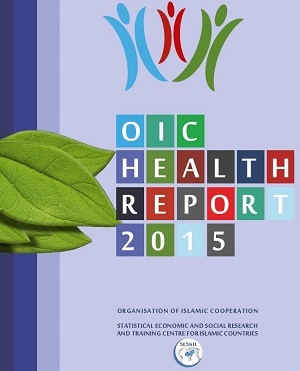 To set the stage, Section 1 of the report provides a brief overview of the state of health in OIC countries. Section 2 evaluates the performance of health systems in OIC countries by underlining some of the most important building blocks like health expenditures and financing, health workforce and health infrastructure. Section 3 discusses the current status of maternal, newborn and child health and nutrition by highlighting the current maternal and child mortality trends vis-à-vis implementation of WHO recommended interventions like antenatal checks-up, vaccination, skilled attendance of delivery, and breastfeeding etc. to curtail the MNC mortality and malnutrition. Recent trends in prevalence of communicable and non-communicable diseases, their death burden and progress towards addressing major risk factors are being discussed and analyzed in Section 4. Section 5 elaborates on the status of medicines, vaccines and medical technologies production and procurement mechanisms in OIC countries along with the availability of essential medicines. Section 6 highlights the current resources and capacities for emergency health response and interventions in OIC countries along with some common gaps in the humanitarian health sector response related with information management and analysis, strategic planning and coordination and service delivery. Section 7 focuses on the linkages between level of information, education and advocacy and health outcomes in OIC countries by investigating the quality of health education and level of awareness about adverse drug reactions and irrational use of medicines. The main findings of the report are summarized in Section 8. The report concludes with policy recommendations aiming to enhance the implementation of interventions at both national and intra-OIC and international cooperation level to improve the state of health in OIC countries.